Before I begin, let me just say right off that I enjoyed reading this book a whole lot and I heartily recommend it. The following harsh criticism is partly because I care enough to wish it was just a bit better, and partly because its subject matter falls in my own general area of expertise (psychology), so I’m bound to be nitpicky. This is Your Brain on Music explores the science behind music, drawing from the latest research in psychology and neuroscience to explore various facets of creating and listening to it. After reviewing some basic information about music and music theory (most of which was new to me), Levitin begins describing the science behind topics such as categorization of music, the role of emotion in music, and musical expertise. My first beef with the book is in its accuracy. Vague hypotheses and tentative research findings are often presented as established fact. However, this is to be expected in any science book written for a popular audience (again, me being a nitpicky psychologist). But there are other little errors. Levitin briefly mentions that Canadian psychologist Glenn Schellenberg was an original member of the popular 80s band Martha and the Muffins. However, a bit of Googling reveals that Schellenberg seems to have only played a guest role on a later album of theirs. This only caught my attention because I’m currently running a study that Schellenberg kindly provided some audio files for. And speaking of name dropping, Levitin devotes many words to telling us how many famous people he has chilled with. At one point, he suddenly goes from talking about the role of the cerebellum in music to an elaborate tale of how he attended conferences with all his scientist heroes and even met Watson and Crick. This autobiographical stuff is interesting enough, but it ruins the flow – the rhythm, if you will – of the scientific stuff when the two are discordantly mashed together. This haphazard organization is also exemplified in the book’s final chapter. During a discussion of music’s primary role in human evolution that is finally starting to lead somewhere, Levitin suddenly jumps to a vague hypothesis about mirror neurons fueling cultural evolution, then jumps again to a rambling, repetitive paragraph that pretty much says “humans live in groups” 5 times in 5 slightly different ways, and then, the book ends. No real final thought; no paragraph even trying to tie the preceding chapters together, just a random stopping point when he ran out of facts and anecdotes to throw onto the page. Did I mention I liked this book? While it may be a disorganized collection of facts about music, each fact is fascinating on its own and well worth reading about. We often fail to think very much about the music we listen to for hours each day, and This is Your Brain on music, while it could use improvement, is an eye opening exploration of the deeper layers of the magical human experience that is music. Side note: In this post, I wondered about the underlying reason for certain musical conventions. For example, why do minor chords sounds sad? Is it arbitrary and cultural? Or is there a more concrete reason? This book answers some of those questions. Long story short, like usual, it’s both. The laws of physics are responsible for some combinations of sounds going well together, but arbitrary choices and conventions also play a large role. E.g., apparently not every culture thinks minor chords sound sad. Interesting stuff. You know those atheist bus signs in Toronto? Well it looks like someone has vandalized one of them…sorta. Um. Maybe I’m not fully understanding the author’s intention, but the sign (er, piece of paper) they put on top of the ad really isn’t at odds with the ad. 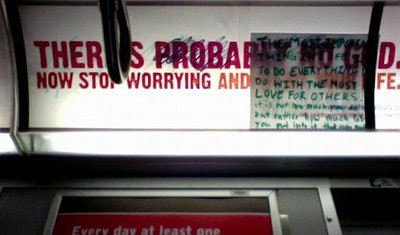 It’s a bit ambiguous, scratching out “prob” and covering “bly no go” with the sign (“there’s a D?”) But the message that love is the most important thing is something most atheists would agree wholeheartedly with. With no supernatural being demanding faith, of course love for others is the most important thing there is. It’s all there is. Some commenters at BlogTO suggest it’s a hate crime. But it’s more of a love crime. It’s like smashing a church sign then spray painting a cross on it. Maybe the vandal is just confused. Or maybe it’s deeper; maybe they are pointing out the common belief that atheists, religious folks and The Beatles agree on: all you need is love. Update: Some have suggested it’s the work of more than one vandal, which would explain a lot.